First impressions of this set were simply "I MUST HAVE!" and that impression came solely focused on the minifigures; Wolverine, Magneto and Deadpool. The Helicopter looked decent and the motorbike was standard but the minifigures made it a compulsory purchase. Deadpool is almost criminally hidden within the chopper yet fortunately we can see the minifigure in its glory on the cover's left corner. First of all, let's have a look at the minifigures. All three are exclusive to this set, so currently if you want these awesome minifigure this is the only way (outside of purchasing them separately) to get them. As this is a relatively small set, the build is rather simplistic and straight forward, making this set suitable for younger children. With two vehicles, the playability is high. The helicopter has spinning rotors, a high degree of "swooshability" and also has..... dun dun dun..... flick fire missiles. Regardless of what adults might think of them, Lego place them in a lot of their sets so they obviously are an attractive feature for children. The base of the helicopter also uses wheels for some degree of function. Whilst it may add a little more to the playability, I think it detracts from the overall look. I also would like to see the missile bay actually open up, as opposed to being a static feature. The motorcycle itself is very basic and to be honest uninspiring. I realise there is only so much Lego can do this, however. The scene is a loose adaptation of one featured in the X-men Origins: Wolverine movie, though Deadpool never featured in this scene nor Magneto in the film at all. Going by the sold listings, the three minifigures total $17.56, with the current asking prices totalling $22.46. If we consider that the full retail price is $19.99, this is a fantastic return already on a set still easily available. Essentially the set is barely losing value after opening the box, which is rather rare for a set still in production. As we can see, the 6866 set is about average in terms of price per piece, giving us a return of around 10c per piece. Considering this is a licensed set, this is rather nice though. Considering the value of the minifigures as well as the remaining pieces, this set certainly does provide value for your dollar! Between DC and Marvel, Lego has thus far issued 29 sets under the Super Heroes line, polybags excluded. Of this, 15 sets are based on DC characters leaving 14 from the Marvel Universe. Breaking down the Marvel Universe sets further there are 3 maxi builds, 3 Iron Man sets, 3 Spider-Man sets, 1 X-Men set and finally 4 Avengers sets. Currently, this is the only X-Men set. To date, the X-Men universe has yielded 6 theatrical releases with another on the way. The four X-Men films have grossed over $1.5 billion theatrically, whilst to date the two Wolverine-centric films have returned over $700 million. With an allegiance of comic book fans as well, it is easy to see that this is a popular theme. Finally, as this is the first official X-Men Lego set, there is no previous data to compare it to. However, when one looks at the CAGR of the Super Hero theme at 21.63% compared to the current 10.49% Lego average, it shows that the Lego Super Heroes line is popular and likely to show further growth. 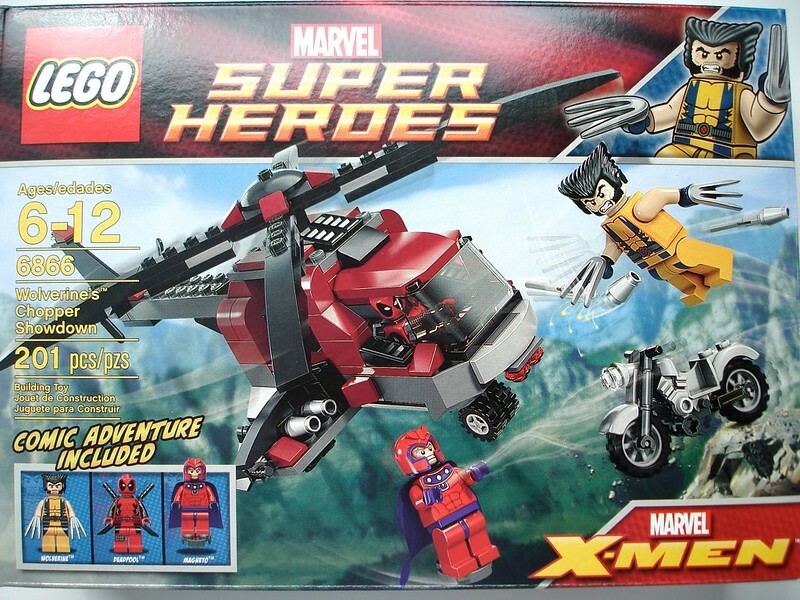 The box art is average with the helicopter prominently displayed as Wolverine and Magneto battle. I do think it is ordinary simply to leave Deadpool in the chopper though, considering he is one of the main drawcards. A chopper can't fly itself though! 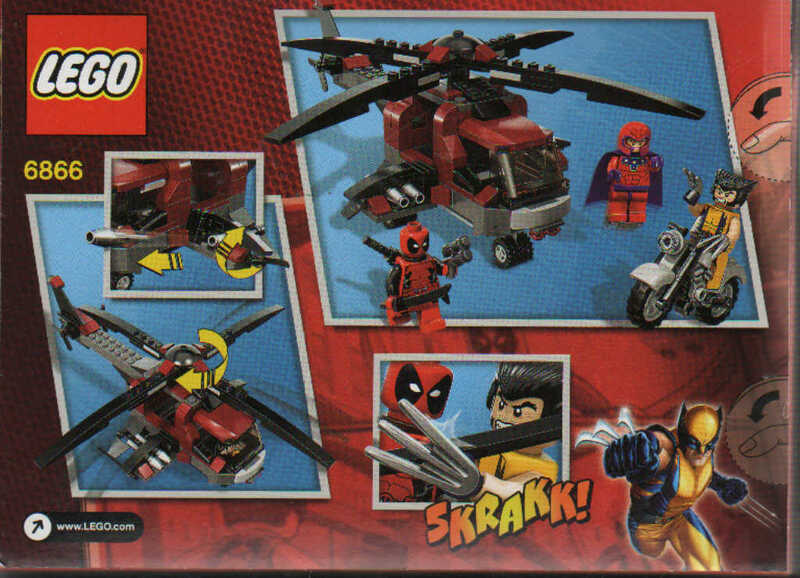 The back is laid out like a comic whilst showing the chopper's capabilities, as well as Deadpool and Wolverine battling it out. The box itself isn't sturdy and can easily be damaged. The amount of free space within the box means it can be prone to crushing or creasing and the cardboard itself isn't thick. Thus far as a set, it isn't performing that well and selling below retail. That being said, the cheaper price the better the price per piece ratio. We have already seen earlier how much of the set's value is contained with the minifigures, so between the two sets of data it shows that the set has significant value. 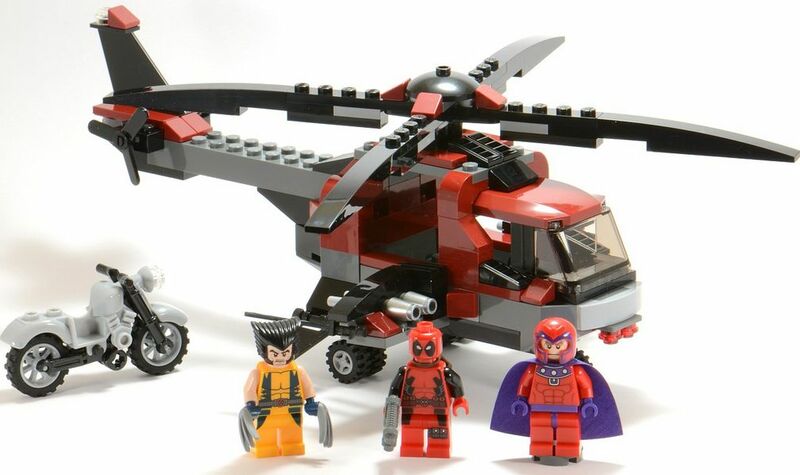 Through both the DC and Marvel themes, Lego has spread multiple characters across the sets and chosen to give alternate prints as opposed to sticking with the same minifigure version. This bodes well for the value retention in sets, as it makes characters in that particular form unique. The helicopter itself does not look that bad with colouring that does make it stand out, though it is a bit chunky and could have used some extra work. Even with a new mould, the motorcycle still seems generic. The minifigures though certainly stand out and will certainly draw the attention of both comic book and Lego fans alike. The X-Men universe has a rich history of characters enthralling comic book and movie fans alike. By opening up the Marvel Universe, Lego are creating sets that interest more than just the Lego fan demographic, similar to the way Star Wars does. With another X-Men movie on the horizon, and considering the characters' involvement in the forthcoming Lego Marvel game, it is unlikely that this will be the only X-Men set. This set is not hard to find below the current full retail price and considering the minifigures already return nearly the full value of the set already, picking this one up really is a no-brainer. It contains popular characters in a popular theme which already shows growth. You cannot argue with the minifigures sale prices already, and it gives potential insight into the demand this set can have in the future. Don't miss out!